The Catholic bishops in the United States recognize a pressing need for health care reform. Too many American citizens lack basic health care coverage and the cost of health care is becoming prohibitive for many more. The Lord Jesus, who came to save us from our sins, manifested a great concern for the sick in his public ministry. He also urged us to reach out to the poor and sick in our midst. The Church rightly considers that government has a responsibility to ensure access to basic health care for all. * We need to develop a plan which ensures access to basic health care for all. * We need to make sure that the poor and the vulnerable, including legal immigrants, are part of this plan. * We need to control health care costs so that it is affordable to all. * We need to make sure that abortion, euthanasia or other immoral activities are not mandated or financed with tax payer dollars. This includes conscience protection for all providers, whether institutions or individual persons, and for all recipients. The bishops, without proposing either a public or private sector option, urge that any plan which is developed embrace these principles. Catholics are urged to contact their United States Senators and Representative to ask them to use these principles to evaluate all proposals that are developed. Strident or shrill rhetoric does not help us to engage in civil and respectful deliberation about a serious social issue with significant moral implications. God grant us the wisdom to discern what is right and the courage to do it. In their twin-flank push for a reform that ensures basic access for all but remains "abortion-neutral" in the process, the US bishops have rolled out a web portal detailing the church's position on the contentious issue. As the Crescent City native returns home, it's worth noting that the last two archbishops named on these shores -- Aymond and Omaha's George Lucas -- were called upward from state capitals. It's an unusual trend, but one that yields a top rank more savvy and nuanced when it comes to policy and politics, simply by nature of the post; in most states, the capital prelate is tasked with being the lead point-man on the church's interests to the legislature and other agencies as the need arises. 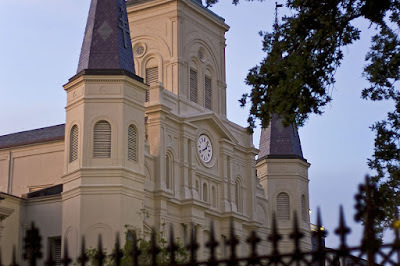 Aymond's installation as the 17th head of the NOLA church begins tomorrow at 2pm Central (1900GMT).